I went to the mall for Victoria's Secret, I heard the makeup was all on sale and I had 10 bucks left on a gift certificate so I figured why not. I just had to go by Macys and check out the Mac counter aaaah! I love purples so I thought it would be a no brainer I would get Violet Fire but after swatching Mercenary I had to get it. Violet Fire was ridiculously sheer as well. The little container on the left is a sample of Impassioned solar bits, it's weird and really chunky! The VS nail polishes were $7 each, or 2 for $12, or 3 for $15. I've never used their polishes before so I only got 2. Mercenary is a frosty gold and bronze, very opaque. Formula was thick but easy to apply. 2 coats. This one is with flash, I just wanted to show the pretty shimmer but color-wise the first pic is more accurate. So pretty! I love this polish! I swatched this color on myself while at the mall a couple of weekends ago and this color is oh so hot. It look fantastic on you! FYI...VS polishes are nice as well. Eeee, I have to stay away from the MAC counter, or I'll come home with all kinds of things :x Nice haul though! Denny, thank you. I can't wait to try the VS polish maybe later tonight! Olivia! Did you go see Style Warrior? I thought most of their colors weren't very wearable for me which I guess is a good thing? For my wallet, har har. That's beautiful! 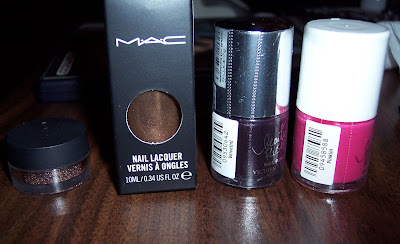 I love my MAC polishes and I need more :) That shade of bronze looks so rich. I passes up Mercenary. Wish I had'nt. I hope it's still available. It really is something special. I couldn't believe how sheer Violet Fire is. I thought for sure it would be a deep creme. 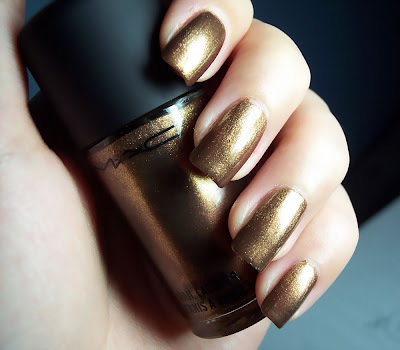 Mary, yes we must get more mac polishes! Lucy, you can still get it! And yeah too bad for Violet Fire, I guess it's okay if you dont' mind doing a lot of coats and really like the color.